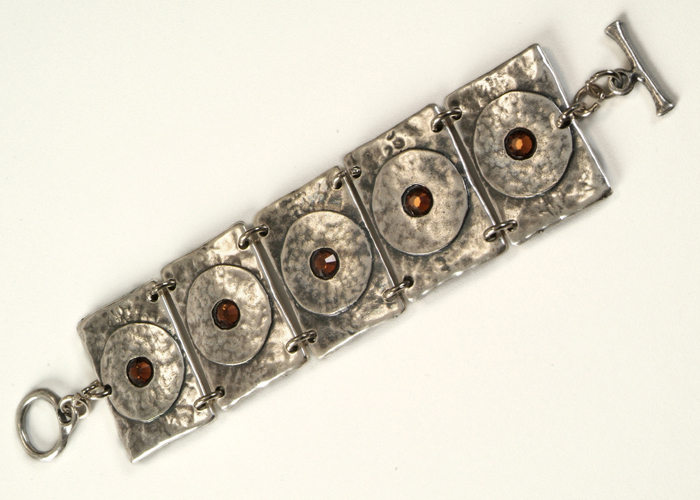 Swarovski crystal centered in a raised round wide frame on each of the rectangular silver plated tiles of this bracelet. Anava Israeli Jewelry offers handmade designer Israeli jewelry with a modern flavor and timeless style that is sure to appeal to lovers of silver and silver plated jewelry. 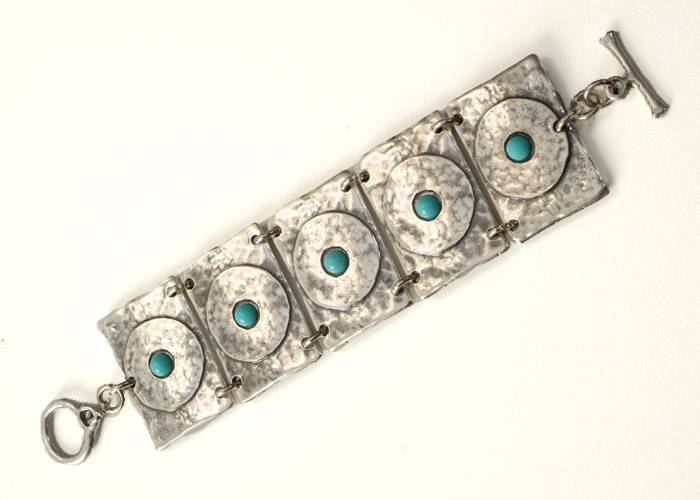 The five uniform rectangular tiles of this hand-worked bracelet are hammered silver. Each section is embellished with a raised circle, in the center of which is set either a solid turquoise crystal or amber crystal from the renowned Swarovski firm. Customers select the color of the crystals. The crystal decoration on the handcrafted silver plated accessories adds a spark of color to these fine examples of modern Israeli designer jewelry making. The bracelet's tiles are set almost flush against each other, linked at to one another at the top and bottom with two silver rings. The silver bracelet fastens with an elegant, easy-to-manipulate bar-and-loop closure. When worn, the bracelet will cover the wearer's wrist almost entirely, creating the effect of a jeweled silver cuff, but with more fluidity of movement. This piece is perfect for lovers of fine handmade jewelry and fine Israeli jewelry, and can be worn by all ages and in most settings.